For those who find most holiday cinematic fare far too saccharine I present an alternative that just might make the annual not-so-festive trek to Grandma's depressing house a bit more appealing -- the musty smell and dreadful doilies notwithstanding. Thanks to the writing/directing team of Jean-Baptiste Andrea and Fabrice Canepa DEAD END is a low-budget Christmas-themed classic that magically manages to masterfully mix terrifying, horrific elements with humorous, laugh-out-loud dialogue. Don't take my word for it; what other film can you think of that has garnered top honors at both the San Sebastian Horror Film Festival as well as at the Pensacola Comedy Film Festival? 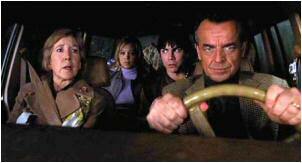 While the script is remarkably tight and the directing is simply superb, primary credit must go to the phenomenal cast featuring the fabulous Ray Wise as the feckless father who decides to take an ill-advised short cut to granny's this particular yuletide eve. Likewise, Lin Shaye as the overwrought, wretched wife is nothing short of sensational while Alexandra Holden as the delicious, decisive daughter and Mick Cain as the sophomoric, smart aleck son also deliver exceptional performances that ring remarkably true. In fact, DEAD END should be mandatory viewing for all acting and directing classes -- it is that good. Clocking in at a mere 83 minutes the tension builds as this totally believable but dysfunctional American family on an apparently endless road to nowhere discovers that, when all is said and done, there are no secrets after death.